Fly fishing vests are multi pocket technical vests created specifically for anglers. These specialist vests enable you to carry all of your equipment and supplier on your body, rather than having to use a rucksack or bag. Giving you easy access to everything while maintaining your mobility and use of both hands. 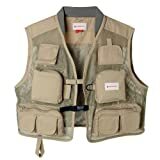 The great thing about fishing vests is that unlike bags, you don’t have to rummage through all your gear to find your supplier. 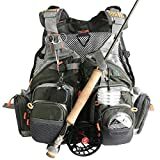 In addition, you can wear your vest all the time, so don’t have to worry about someone taking your bag or accidentally forgetting to fix it up when you wander off to fish elsewhere. When selecting a suitable fishing vest, you’re going to want to consider the material (do you need something to keep you warm or cool? ), the amount of pockets / compartments that you need and the quality of the vest. 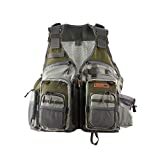 Without further ado, we’re going to be reviewing the 3 best fly fishing vests available on Amazon. ADJUSTABLE SIZING - Adjustable shoulder and waist straps for the perfect fit. COMFORTABLE - Breathable mesh back allows for air to flow freely so you can stay cool and dry. At #3 we have a fantastic technical fishing vest from AnglaTech. This extremely lightweight vest is designed with two things in mind; providing the perfect balance of comfort and ability to hold the maximum amount of gear. The vest comes in one size, with adjustable straps that ensure the perfect fit for both men and women alike. With a mesh back, air is able to circulate keeping you cool even on hot days. While the design of the vest distributes weight evenly across your upper body, enabling you to fish comfortably during use. Available in sand and forest, you have a choice of two classic fishing vest colors. Overall, this is a top quality technical vest with a very affordable price tag. Maxcatch’s Fly Fishing Vest is an excellent modern technical vest with a huge amount of technical features for the price. The vest has a variety of zip pockets, two shell compartments for larger items and a rod holder strap. Like the previously reviewed AnglaTech, Maxcatch’s offering has a mesh back, reducing the weight of the vest and enabling air to circulate. A build that makes the vest ideal on both hot and cold days. All in all, there’s little between this vest at AnglaTech’s. However, at a slightly lower price, Maxcatch’s vest takes second spot in our top 3. If you’re looking for slightly bigger or small solutions, Maxcatch’s Sling Pack and Backpack provide alternatives to their fantastic Vest. At #1 spot is Redington’s Clark Fork Mesh vest. This classic mesh vest has everything you want from a fishing vest, it is lightweight mesh, has a knit collar for neck comfort and comes in 4 different size options. From an appearance point of view, this vest will make you look like a serious angler. It’s traditional, comes in a classic sage color and has all of pockets and features that an ‘old school’ angler would expect to see. Storage wise the Clark Fork vest has you covered. There are 11 pockets in total, including 9 external zip / velcro pockets; giving you fast and secure access to all of your gear. The vest is durable and comes in a quick dry fabric, providing an all weather solution. At just a fraction of the cost of the other vests in the top 3, this Redington vest is a fantastic pick up. This concludes our fly fishing vest review, hope it helps!